Skuodas (, Samogitian: Skouds) is a city located in Klaipėda County, in northwestern Lithuania, on the border with Latvia. The Bartuva river flows through the town. Skuodas was first mentioned in written sources in 1253. At that time it belonged to Ceklis land. In 1572 city rights were granted to Skuodas thanks to Jan Hieronimowicz Chodkiewicz who owned the city. 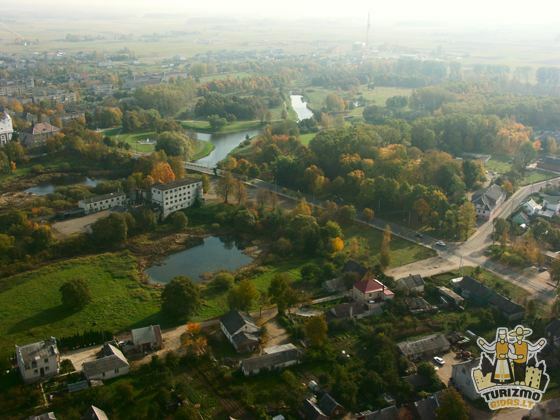 The same year after the city rights were granted, a new part of the city started to settle on the right wing of Bartuva river. In the centre of this part there were built a new rectungalar square, town hall, commercial buildings. After Chodkiewicz's era Sapieha family got the city as a trousseau and became the owners of Skuodas. Sapieha family owned the city until 1832. In 1776 Skuodas lost city rights and became just a border city with a customs. In 1821 present masonry Evangelical Lutheran Church was built. In 1847 current Catholic Church was built using masonry of stone and bricks. It reflects features of Romanesque Revival architecture. This church was consecrated by bishop Motiejus Valančius in 1850. In 1614 parish school was established. Railway branch line Priekule-Klaipėda was built in 1915 and printing house was established in 1911. The town had a Jewish community in the 19th century, with 4 synagogues. By 1897,almost 2,300 Jews formed 60% of the population and dominated commerce in the town. In 1941, following the German invasion, and the establishment of persecutions by Lithuanian nationalists, 500 Jews of the town were massacred. 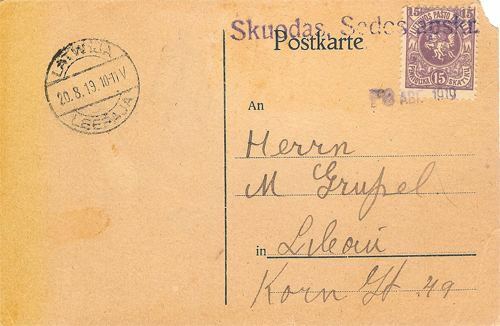 During the interwar period Skuodas had about 4410 inhabitants. It was known for its shoe factory Kontinent. Skuodas also had a new cinema with modern equipment. The city suffered severely during World War II. After the war the ruined rectangular square was rebuilt. In 1992 the coat of arms of Skuodas was approved. Nowadays Skuodas has a gymnasium, a primary school, a secondary school and a high school. There is also a museum, post office, centre of the culture, central hospital of municipality, foster home and public library in the city. The city's name Skuodas originated from the surname, Skuodas. Germans called the city Schoden, and Skudn. At the end of the 16th century, the new part of the city was called Johanisberg or Johanisburg. However these names did not catch on. Remigijus Motuzas (born 1956), a Lithuanian diplomat, current ambassador of Lithuania to Russia.